As one of the only Jewish teachers in my school, I’m fortunate that my co-teachers are interested in learning about my traditions and celebrations. As we neared Winter Break, they asked if I would do a mini-Hanukkah lesson. I was excited to prepare and teach a lesson, and then went above and beyond after searching for activities online (thank you Google and Teachers Pay Teachers!) I decided to do a cultural winter celebration activity during reading centers. I spent a lot of time finding, creating, and organizing materials. 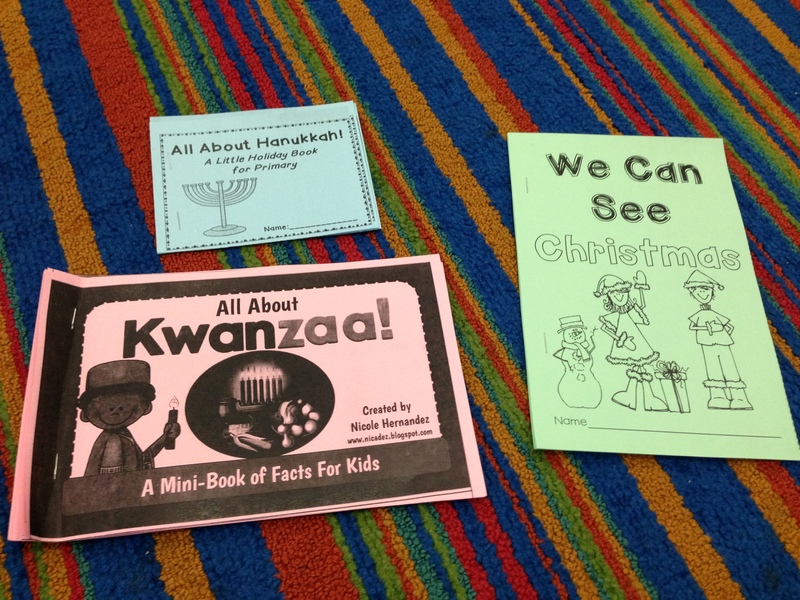 I used a primary introduction to Hanukkah mini book, introduction to Kwanzaa mini book, and a 3 holiday sorting activity (sorting main themes and characteristics); these activities were used for all guided reading groups, and I spent one day in each class leading centers. I also found a Holiday Readers Theater. I assigned each student a part, and put a high, medium, and low reader on each part so they could choral read together. Each copy was highlighted, and students practiced their parts during guided reading on the second day of the lesson. As a conclusion, each class performed the Readers Theater. These lessons took a lot of time to prep and plan, but I know it’s worth it. Students need to be culturally aware of other religions and celebrations around the world. They need to learn to appreciate diversity and that there are similarities between the celebrations. After finishing these lessons, I am excited the activities went very well. Students didn’t have a lot of background knowledge about Hanukkah or Kwanzaa. They were curious, interested, and tried hard reading the difficult words in the mini books. While reading, we compared and contrasted details between the holidays. They asked about certain vocabulary words, and it was eye-opening that I had to explain who African Americans are to help them understand who celebrates Kwanzaa. We also discussed how Kwanzaa was different than the other holidays since it isn’t a religious holiday and was created in 1966. I asked the students if it was an old or new holiday, and they said old; I had to give them context to compare 47 years versus 2000 with Christmas so they understood it’s fairly new! 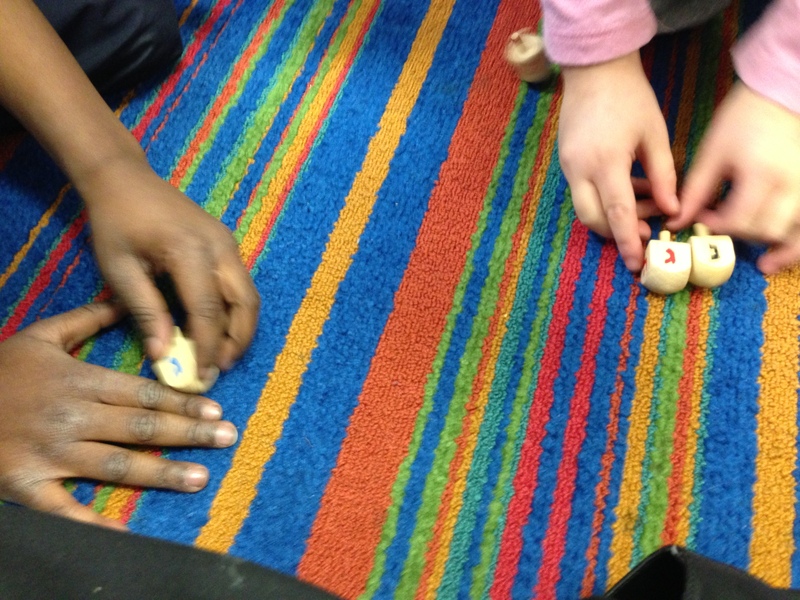 Students loved playing the game of dreidel; I explained the rules and let them spin for fun. Students wanted to know what letter they landed on and what it meant; there were cheers when they landed on Gimmel! I also have one student who celebrated Eid earlier this year. During her small group, I gave her the opportunity to share about her holiday and traditions. During our discussion, we were able to find similarities between Eid, Christmas, and Hanukkah. I wish there had been more time to discuss deeper and really compare and contrast the different holidays. The Readers Theater went well too. It was the first time the students had done one, but they were excited. They practiced their parts in small groups then as a whole class before performing. We were able to record their performance using an iPad, and the students loved watching it! I’m so glad I was able to teach this lesson and help students learn more about other cultures and celebrates happening around the world. At the end of one of the small groups, I had time to do a whip-around, and the students shared one thing they had learned. One student said, “Hanukkah and Christmas you can celebrate with different families and traditions”. Another said, “Holidays are special to all people”. I was proud of these lessons and that the students understood the bigger message I was teaching.